Some of the popular and frequently used system resource generating tools available on the Linux platform include vmstat, netstat, iostat, ifstat and mpstat. They are used for reporting statistics from different system components such as virtual memory, network connections and interfaces, CPU, input/output devices and more. As a system administrator, you may be looking for that one tool that can give your a good amount of the information provided by above tools, even more, a single and powerful tool that has additional features and capabilities, then look no further than dstat. 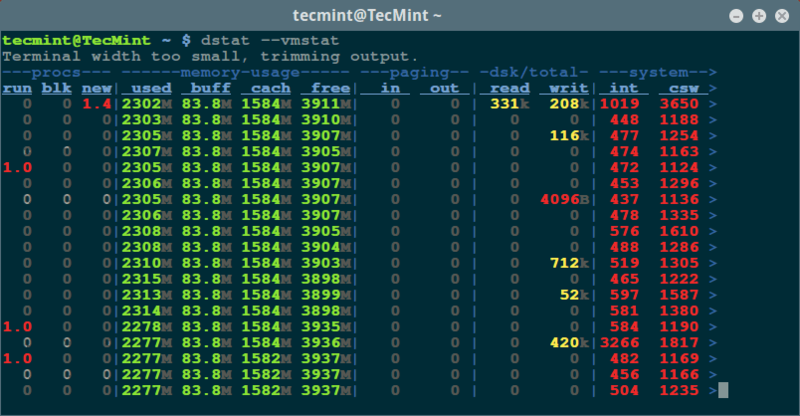 dstat is available to install from default repositories on most Linux distributions, you can install and use it for monitoring a Linux system in the process of performance tuning tests or troubleshooting exercises. It works in real-time, outputting selective information in columns, including the magnitude and units for stats displayed after every one second, by default. Note: The dstat output is aimed specifically for human interpretation, not as input for other tools to process. Below is an output seen after running the dstat command without any options and arguments (similar to using -cdngy (default) options or -a option). CPU stats: cpu usage by a user (usr) processes, system (sys) processes, as well as the number of idle (idl) and waiting (wai) processes, hard interrupt (hiq) and soft interrupt (siq). Disk stats: total number of read (read) and write (writ) operations on disks. Network stats: total amount of bytes received (recv) and sent (send) on network interfaces. 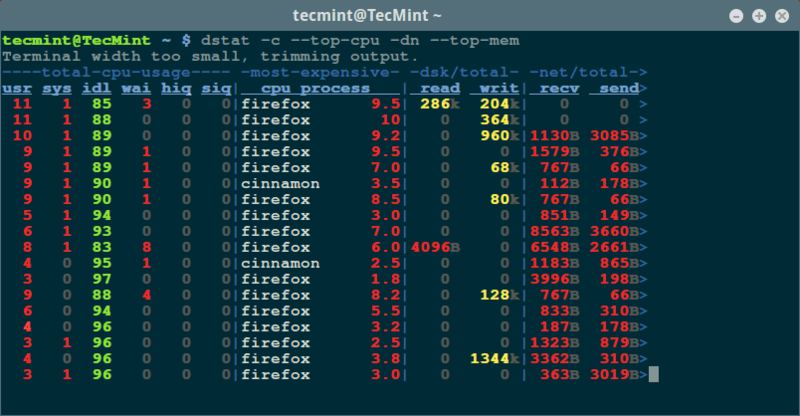 Paging stats: number of times information is copied into (in) and moved out (out) of memory. System stats: number of interrupts (int) and context switches (csw). Process stats: number of running (run), blocked (blk) and new (new) spawned processes. 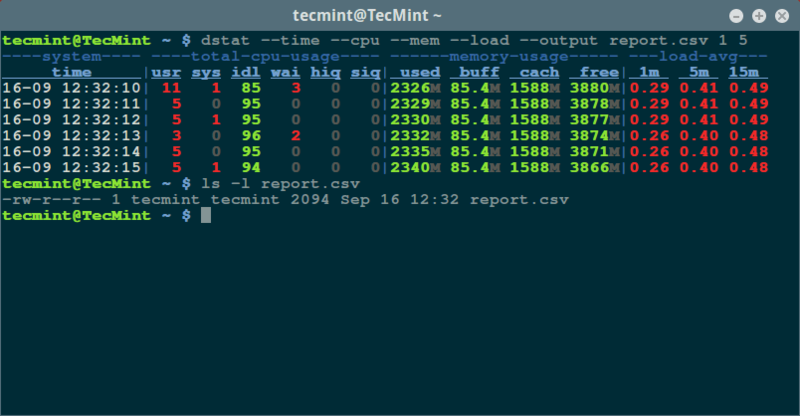 Memory stats: amount of used (used), buffered (buff), cached (cach) and free (free) memory. I already explained at the last three sections (paging, disk and system stats) in the previous example. 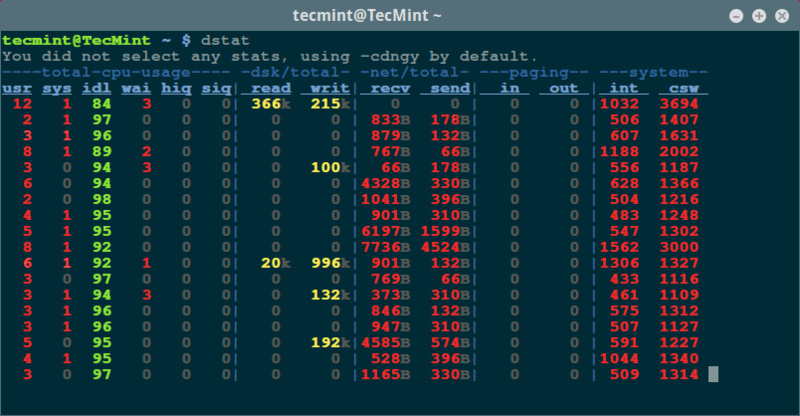 Let us dive into some advanced dstat system monitoring commands. In the next example, we want to monitor a single program that is using the most CPU and consuming the most amount of memory. Additionally, you can also store the output of dstat in a .csv file for analysis at a latter time by enabling the --output option as in the example below. 0Here, we are displaying the time, cpu, mem, system load stats with a one second delay between 5 updates (counts). For more usage information, look through the dstat man page or visit the homepage at: http://dag.wiee.rs/home-made/dstat/. dstat is a versatile, all-in-one system resources statistics generating tool, it combines information from several other tools such as vmstat, mpstat, iostat, netstat and ifstat. I hope this review will be helpful to you, most importantly, you can share with us any suggestions, supplementary ideas to improve the article and also give us feedback about your experience using of dstat through the comment section below. Great post you have here, Aaron. Did you know that if you manage your server with RunCloud, these stats are available for you without having to install anything. We developed RunCloud which will configure your server to the best configuration so you can focus only on things that matters.